The ritual of quietly adding to the textile reflects my day; each gesture adds another phrase to the textile’s evolving narrative, as it exists in my here and now. Did the first woman to work on this cloth’s surface well over 100 years ago, do the same each day as I do now and stitch her inner thoughts through it? (I’m assuming that it was a woman). The regularity of her delicate work hides any possibility of potential departure from what was expected of a woman of that time. Yet she breathed in and out, with thoughts drifting as her fingers skilfully worked the needle and thread through the cloth, creating small gaps and allowing air to flow through its surface. My own stitches feel clumsy by comparison but rather than being hidden thoughts, my stitches loudly signify areas of discord. The delicate cutwork created in a different era, feels almost disconcerting in its regularity but this is what both fascinated and unnerved me as I contemplated what I might add to this flawless cloth. The original woman’s personal life lies buried within her tiny, methodical stitches whereas now, with each stitch, mine private narrative is exposed. 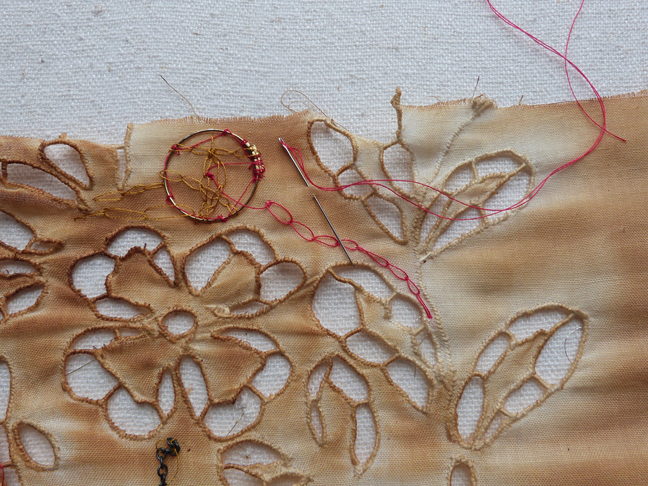 Were I to attempt to defend my tentative efforts at autoethnography through stitching, what would she make of how her careful work is being transformed now? Would we intrigue or just embarrass one another? I am in dialogue with this woman from the past as I draw out my sense of self on this cloth’s surface. I’m conversing with ghosts.